In her diary, Regina Shober Gray notes occasional instances where (usually at the behest of a friend) she assumed a more public profile. Her literary efforts were prized by her contemporaries; one set of her verses was published both in Boston and in Philadelphia in 1862. That Mrs. Gray could feel competitive about her work, even with her friend Mrs. W. B. Richards, may be seen in the diary. This first entry also refers to the diarist’s friend Emily Adams, newly-wed to Caleb Agry Curtis, whose father had died in late March, drawing them back to Boston from a European honeymoon. 61 Bowdoin Street, Boston, Sunday, 10 April 1864: A wet afternoon; I joined Emily Adams after church and walked home with her, glad of the chance to see her for a few minutes without feeling myself an intruder in her mother-in-law’s house of mourning. Three weeks ago, to-day, they were in Venice, preparing for a trip to Sorrento, with the Gordons next day – when the sad news came to hurry them home. They reached N.Y. on Wed’y last, the day after the old gentleman’s funeral, a terrible blow to Mr. Curtis of course. Emily looks well, and enjoyed every moment, till they had to start for home. Yesterday, about 30 ladies met at Mrs. Richards’s to hear her read her letters for the Philad[elphia] Sanitary Fair P.O. ; she has been urged to read by some young friends – and did so thinking it might incite others to help. She read for an hour, then invited us down to a lunch of ices, jellies &c then read another hour – some 50 or 60 letters – all fluent – some quite entertaining & showing play of fancy. All seemed interested and amazed at her ready fluency – the fruit of long practice as editress of the Transcript. She has been a very important help to me. They insisted at first that she had read mine too – and if she had not, I ought to &c. I told them they could hardly expect me, in cold blood, to show myself as 2’d fiddle &c. &c. – I should like to know what would tempt me to do such a thing!!! Sunday, 17 April 1864: …Mrs. C.A. Curtis brought Mary [Gray] & Elise [Richards] each a splendid Roman sash; never were two girls more surprised and pleased! She gave Mary news of Jessie Gordon too which she was glad to get, not having heard from Jessie this long time. Poor Mary met with a mischance in tearing her nice new alpaca, worn only two days, so badly that the skirt had to be made over and turned upside down, just undoing last week’s work – rather discouraging, with Isabella [Furfey] sick, and work accumulating so fast. Rebecca [Wainwright] took tea here on Monday, bringing some autograph letters of Daniel Webster – one of which I am to give to the Philad. Fair, and one keep for myself. We were shocked to hear of Mr. Wm. P. Lyman’s death, after a few days illness – an hour before he died, his wife learned for the first time that he was alarmingly ill. Poor woman, he could have been little comfort to her, these many years, but she is overwhelmed at the shock. How her heart and home have been torn and shattered in these 3 last fatal months. We have taken Regie [Gray] away from school, until next fall. I wish I could send him to Philad. or somewhere away from our harsh airs. But the way does not seem to open for any such change; his throat troubles gives us great anxiety about him. Sam [Gray] went up to Ball’s studio this pm. 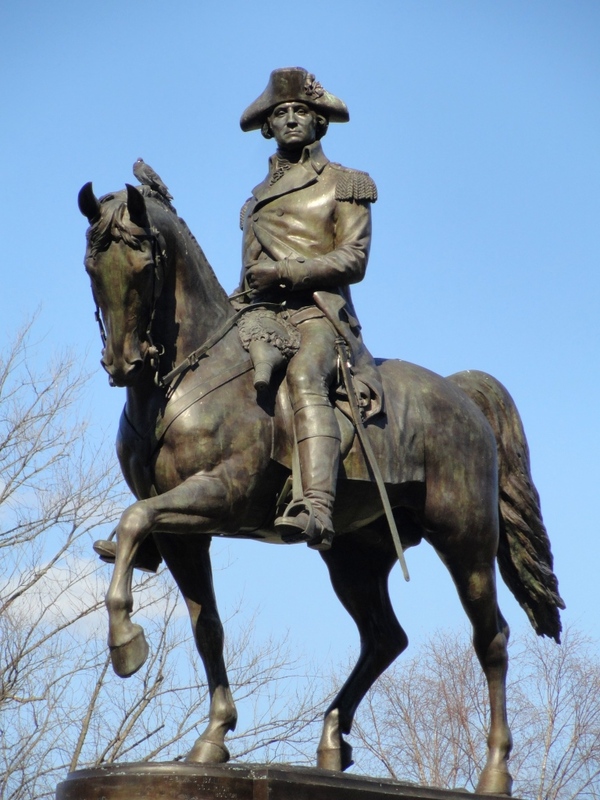 to see his colossal stature of Washington – every body is delighted with it – I must try to get there tomorrow. Hedwiga Regina Shober (1818–1885) was married to Dr. Francis Henry Gray 1844–80. Entries from the Hedwiga Regina Shober Gray diary, R. Stanton Avery Special Collections. Emeline Matilda Adams (1823–1883) had married Caleb Agry Curtis in January. Caleb Curtis died on 30 March. Close friends of the Grays’. Dr. Charles Gordon (1809–1872) married Mary Avery Upham in 1845; the two families had shared a house in Manchester during the summer of 1860. Emily Adams Curtis’s aunt Cornelia Wells Walter (1813–1898), who married William Bordman Richards in 1847. That is, a fund-raiser for the Philadelphia Sanitary Fair. Before her marriage, Mrs. Richards had been the first woman editor of a major daily newspaper – the Boston Transcript. Mrs. Gray, in Boston, was supporting her sisters’ efforts to raise money for the Sanitary Fair in Philadelphia. The diarist’s daughter Mary Clay Gray (1848–1923). Mrs. Richards’s daughter Eliza Bordman Richards (1848–1924). The Gordons’ daughter Jessie Gordon (1848–1884), who married Gardiner Sherman in 1881. The Gordons were also traveling in Europe. The diarist’s best friend, Rebecca Parker Wainwright (1820–1901). Daniel Webster (1782–1852), twice U.S. Secretary of State and Senator from Massachusetts 1827–41 and 1845–50. The Dehon household had recently moved from Louisburg Square to a new house at 216 Beacon Street. William Pratt Lyman (1828–1864); his daughters Minnie and Lily had died earlier in the year. The diarist’s third son, Reginald Gray (1853–1904). Mrs. Gray’s second son, Samuel Shober Gray (1849–1926). George Washington (1864) by Thomas Ball (1819–1911), now in the Boston Public Garden.